1. Winning the Shorty Award enhances our profile. The higher our profile, the more well-known we become, and the greater chance there is a theatre near you will want to book us! 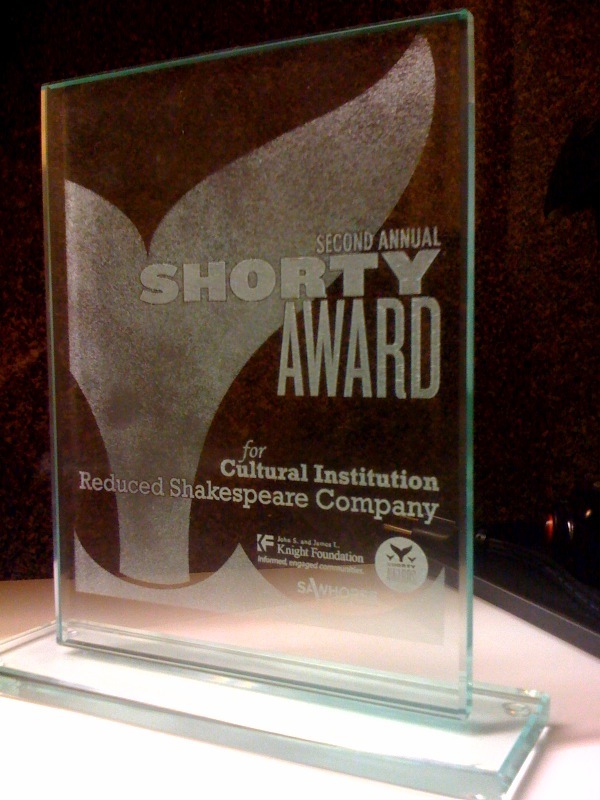 2. Who else should win a Shorty Award but a Reduced Shakespeare Company?! We’ve been producers of reduced content for years. Please nominate us for a Shorty Award in the #culturalinstitution category by clicking here. Anybody with an active Twitter account can vote (you can’t just create a Twitter account to vote, they’re too clever to allow that). Finalists are judged not only on the quality of their Tweets, but also the number and quality of your votes! So when you go to the Shorty Awards website and fill in the vote box (“I vote for @reduced for a Shorty Award in #culturalinstitution because…”), please make the reason cool and brief! Numbers count too. As of today, we have over 4000 Followers! If only ten percent of you vote, we’ll win. Check out the Shorty Awards. Vote for @reduced in #culturalinstitution before Friday, February 11, 11:59 pm EST. Give a good creative reason. And check out the other nominees, in all the categories. There are some fantastic folks out there.